Gail Porter and Chris Fleming take a spirited road trip through the West Coast of America looking for the ghostly locations where the legends of stage and screen reside. 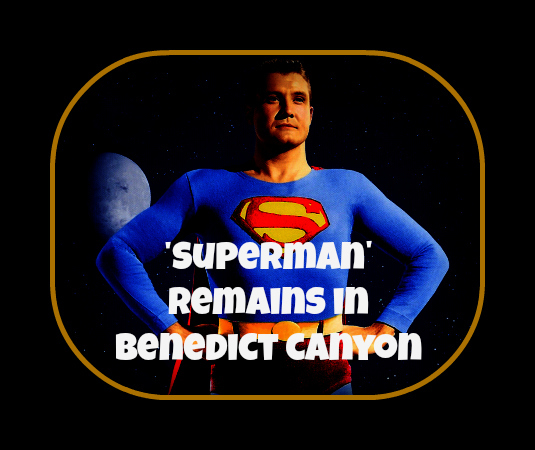 One of the spookiest stories of a celebrity ghost involves the alleged entity of actor George Reeves, best know to a generation of pre-adolescent Baby Boomers for playing the Man of Steel on TV's Adventures of Superman throughout the 1950s, and whose dark and mysterious tale was dramatized in the 2006 film Hollywoodland. Although charming and likeable, Reeves was also naughtier than his clean-cut TV alter ego and enjoyed all the illicit perks of the Hollywood nightlife before being found shot in the head in the bedroom of his modest Benedict Canyon home (1579 Benedict Canyon Drive, Los Angeles) in 1959. Los Angeles police ultimately ruled Reeves' death a suicide and blamed it on his inability to get an acting job playing anything other than the caped super hero. The cops glossed over the fact that Reeves was launching a renewed career as a TV director, and dodged the fact that the actor's longtime acquaintance who bought the Benedict Canyon home for him, was insanely jealous after Reeves dumped her for another woman. She was married to a powerful studio insider with connections to both the police and organized crime, who quietly cleaned things up when showbiz types landed in serious trouble. Then there was the lovely young club-hopping socialite Reeves planned to marry who's account of the night Reeves died had more holes in it than the actor did by the end of the evening. Whether suicide or murder, all the unanswered questions may have left one very restless spirit in Benedict Canyon. In 1969, a decade after Reeves' death, rumors circulated about some unusual happenings at the former Superman's home, but his lover Toni Mannix—who inherited it from her ex-lover and had struggled to keep it rented for years—refused to discuss it. The renters revealed that one night while entertaining guests in the living room, they heard noises. The bedroom—Reeves' bedroom—previously neat and orderly, was a mess: linens torn off the bed, clothes strewn around. They straightened the room and returned downstairs to find that all the drinks on the coffee tables had been moved to the kitchen. Another time, the couple's German shepherd barked at the bedroom door furiously, then suddenly cowered and slunk away as the tenants peeked inside and discovered the bed had been moved across the room. The last straw came around 3 a.m. one summer morning when the apparent ghost of Reeves, dressed in his TV Superman costume, appeared in the living room. Within the hour, the tenants had moved out. Daily Planet editor Perry White's oft-quoted exclamation "Great Casesar's Ghost!" might now be modified, exchanging the Roman emperor for the Last Son of Krypton. Actor George Reeves died at 1:59 am on June 16, 1959. Not the comic book character, of course, but the man who personified the "real" Superman for an entire generation of television fans. Even though the initial coroner’s report listed Reeves’ death as an "indicated suicide", after more than four decades there are many who do not believe that he killed himself. The death remains an unsolved mystery. Could this be why ghostly phenomena has been reported at the former Reeves house ever since? Many believe that the ghostly appearances by the actor lend credence to the idea that he was murdered. Over the years, occupants of the house have been plagued by not only the sound of a single gunshot that echoes in the darkness, but strange lights and even the apparition of George Reeves. In the 1980’s, while the house was being used as a set for a television show, the ghost made another startling appearance. He was seen by several of the actors and crew members before abruptly vanishing, creating yet another mystery in this strange and convoluted case! 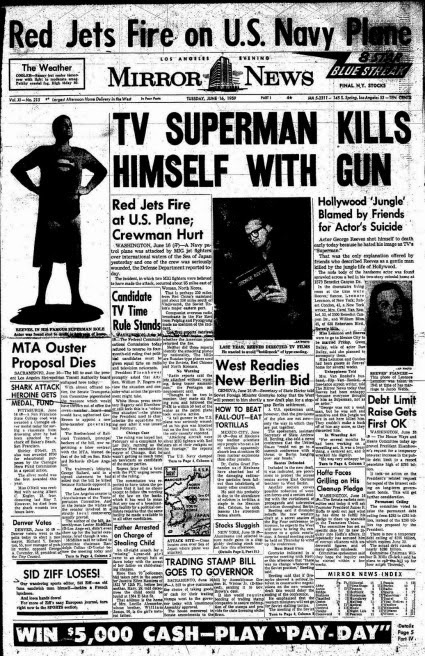 George Reeves still reportedly haunts the home where he allegedly committed suicide/was possibly murdered...depending on who you believe. In late 2012, a nearby resident reported that they continue to hear strange noises coming from the property and that Reeves once appeared to them in full Superman attire on the street in front of the house.